In short: HK operates under a "One Country, Two Systems" policy which means that even though it is now back to being a part of China, it has S.A.R. (Special Administrative Region) status which means it is like a country within a country that is governed by its own self-elected government (headed by the Chief Executive, sort of like the Mayor or President of this entire geographic area and the activities that happen inside it). At least, that's what's supposed to happen. What kickstarted these protests is that in preparation for the next elections in 2017, China recently announced that it was planning to revoke HK's democratic rights by only allowing people to vote for their next leader from a pre-selected pool of candidates chosen by the Chinese Communist Party. That's like telling a writer they can write whatever they want so long as they use the words you provide them first. That's like telling a chef they can cook whatever they want but only with ingredients you have supplied. That's like telling a fashionista or personal shopper, sure they can choose whatever outfits best fit their personality... but they have to choose from one particular shop. Or only clothes of a certain colour. It doesn't count for anything. In 1997, when Britain handed Hong Kong back over to China, a treaty was signed which dictated that for the next 50 years... What China has done is 1) breached that agreement 2) prematurely 3) with poorly communicated justification at that. 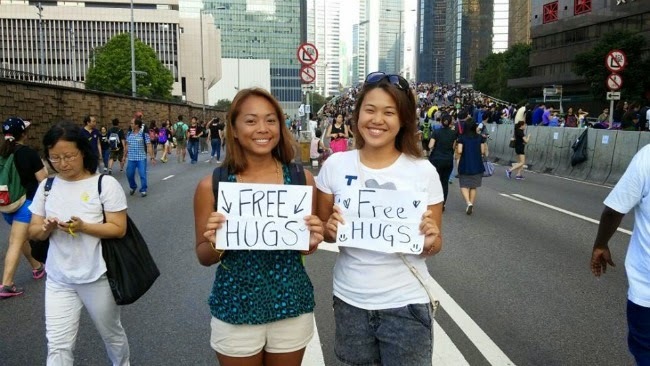 Some people have looked at these protests and used it to jumpstart a bunch of other spinoff debates: Is Hong Kong's behaviour a result of brainwashing and post-colonial sentiments? 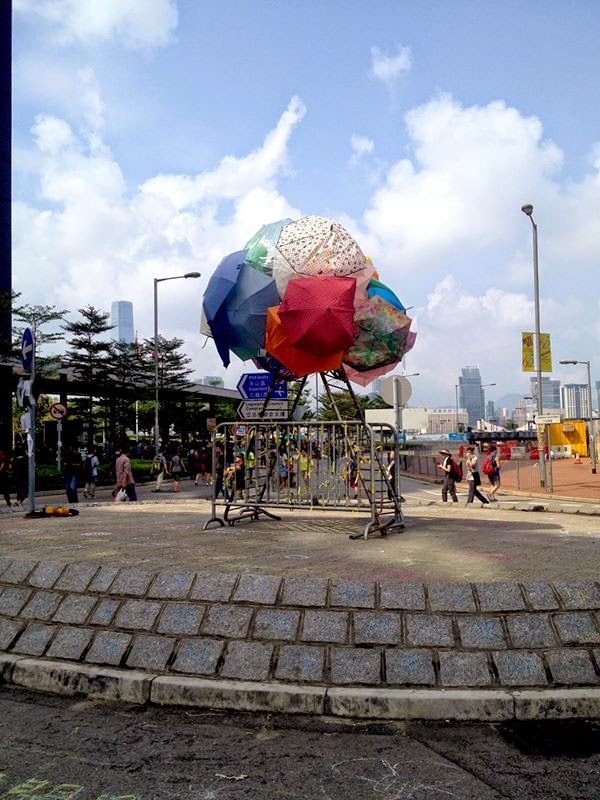 Does Hong Kong have a superiority complex against mainland China? Do foreigners and minority citizens have a say in all this? Sure, these are valid and actually very interesting questions. But that's not what this is all about. Yes, they are related. No, I don't think we should distract ourselves from the bottom line here. Otherwise, I could counteract with even more questions: What makes you think HK is brainwashed and cannot think for itself? 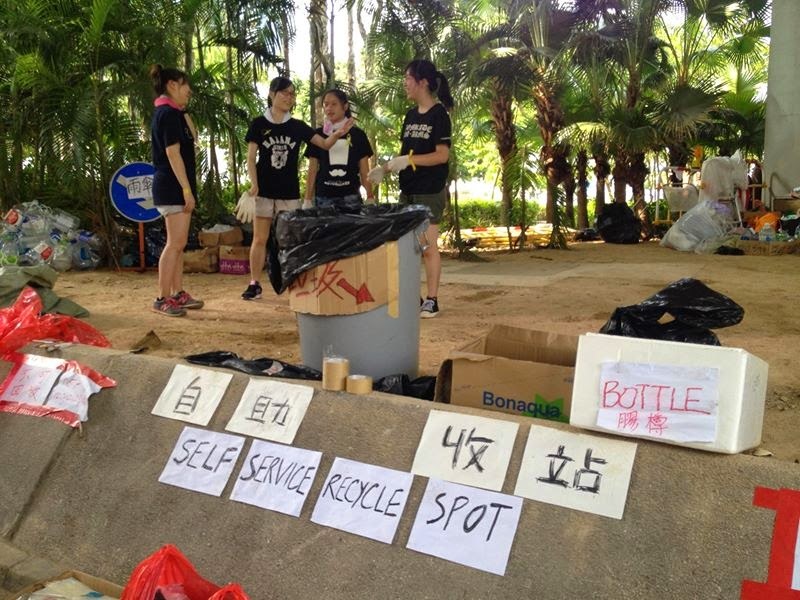 Does HK have a reason and a right to feel "superior" in some ways? 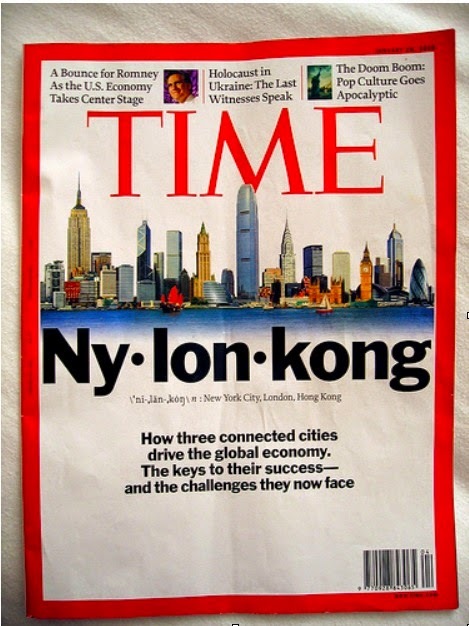 Is it possible that Hong Kong has evolved, taking the best of both East and Western society with proven success (check out HK$6k Scheme + Time Magazine’s article on Nylonkong)? If they have a long-term investment in HK and their livelihoods may be affected, why shouldn't they have a say? Why can't they have an opinion? In short: this all started because China went against their word. Crazy riots or peaceful protest? Let me make this clear: the only riot in this whole thing is the one people are internalising inside their hearts. At least, that's as far as I know right now. Yes, tear gas was thrown at the crowds on Sunday. Yes, people were angered and started to fight back. No, I don't personally know which side attacked first. 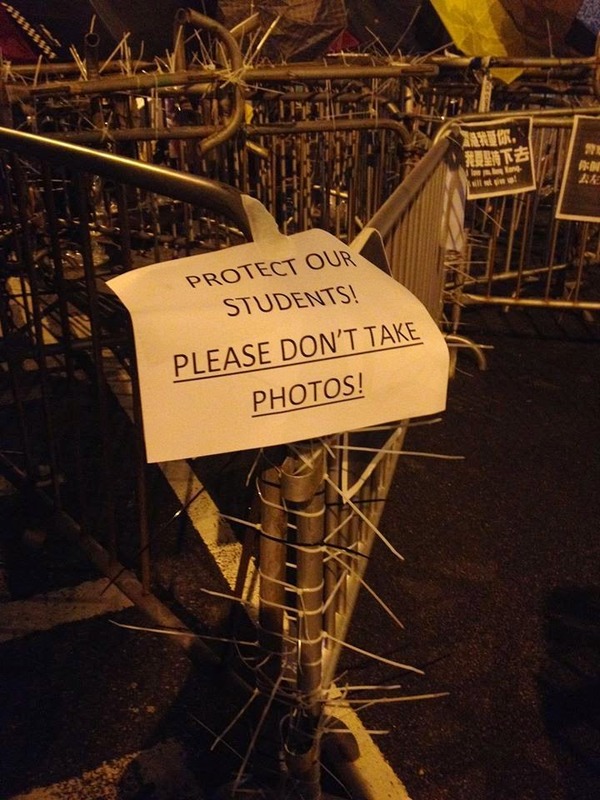 Neither do I think the HK Police are at fault. I find it hard to believe your average cop would want to tear gas his own people. 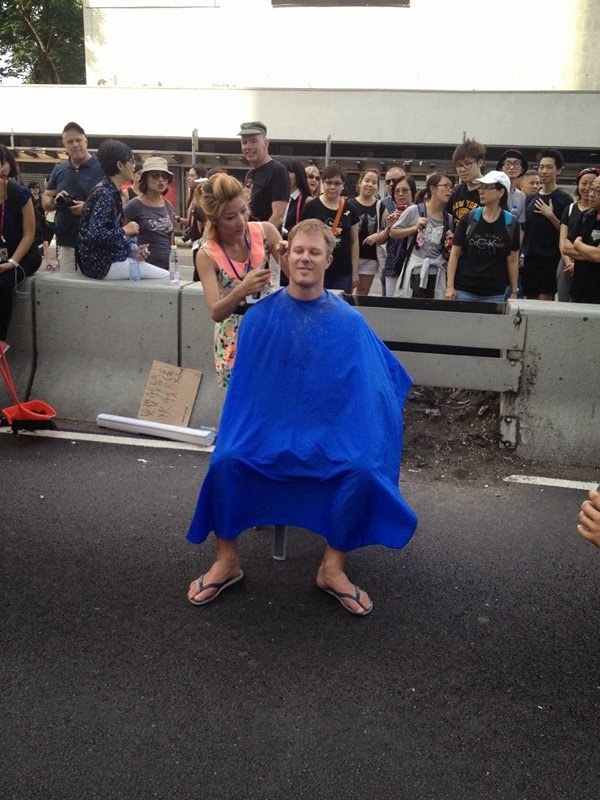 That's not what HK cops do. Under pressure and unseen forces from behind and above, yes. Of their own accord, doubt that. Please be aware also that there is a delay in media reportage and furthermore, every news reporter has a system of self-editing, filtration and censorship. Even my opinions and focus comes from my background and context, which is why I wanted to share that with you first. 1) There is no riot and this is not a violent protest. Only hundreds of thousands of people "being present" in the streets. 2) There are 3 main congregations in Hong Kong where people are protesting: Central/Admiralty, Times Square and Mong Kok. 3) Yes, the air can feel tense and electric (particularly at night). 4) The air can also feel strangely peaceful and warm, especially during the day. I guess that's what happens when loads of people come together and there's not a car in sight. 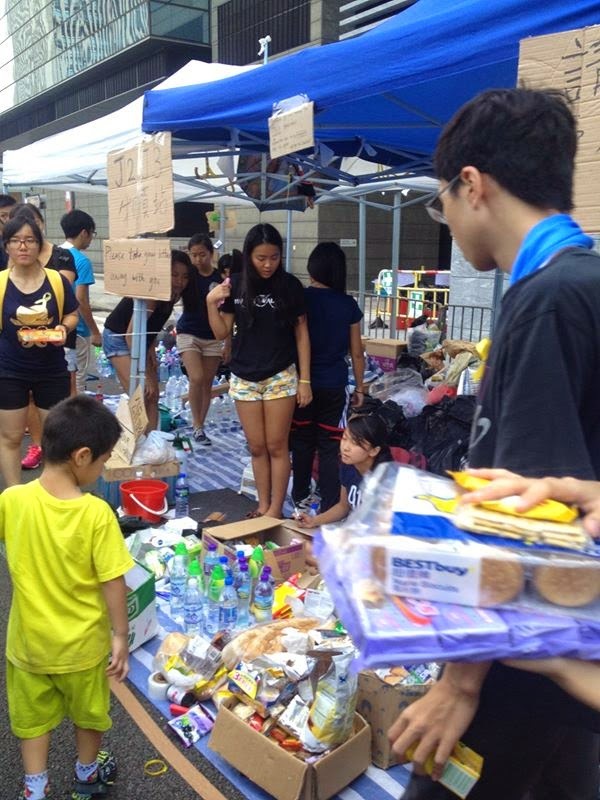 5) Except for the areas where people have gathered, the rest of Hong Kong is operating "business as usual" although it's undeniable everyone's thoughts are distracted and focused on this. 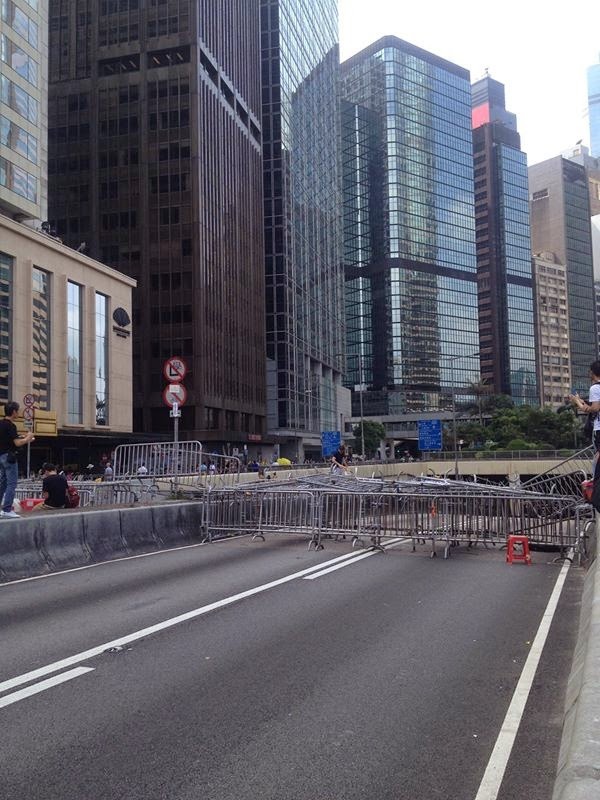 6) Some offices, schools and MTR stations are closed in the areas affected. 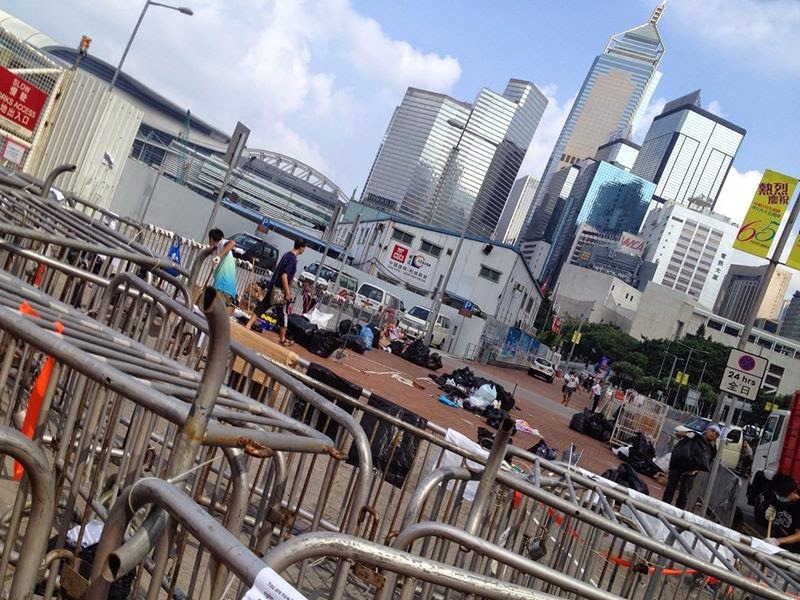 People have also been advised to stay away from the Central, Times Square, Mong Kok areas. 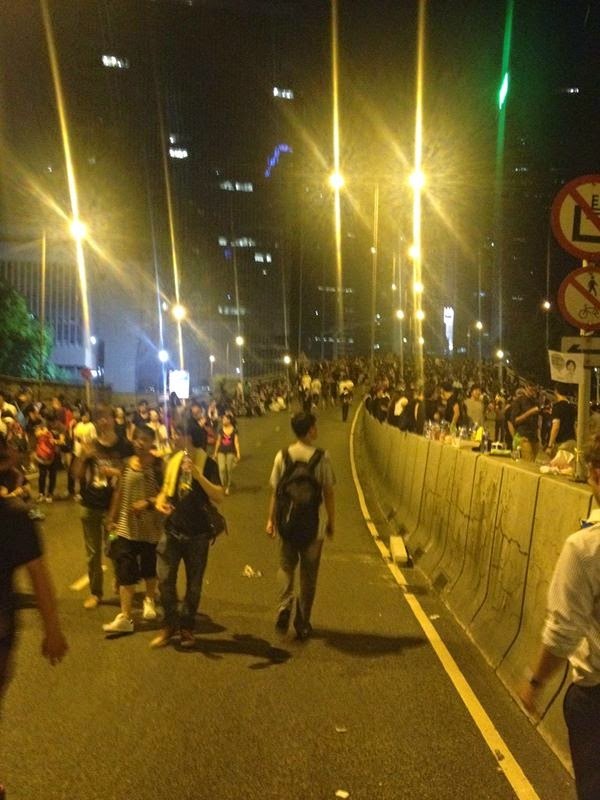 7) Mostly it is high school and college students forming the protest group and staying for nights on end. But more and more there are members of every society in HK showing up and giving support. 8) "Stay calm" and "Do you hear the people sing?" (from Les Miserables) are some of the trending catchphrases of the last few days. 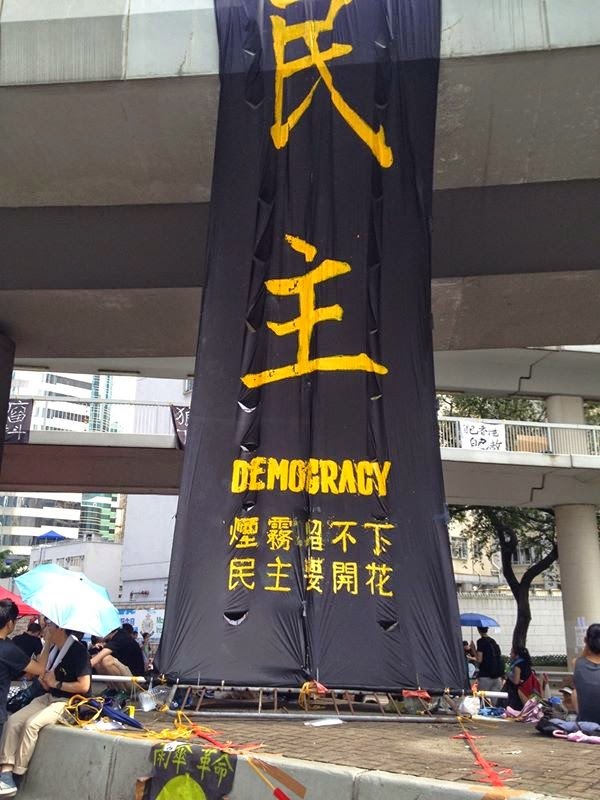 9) This protest was originally called Occupy Central but since it has spread beyond that district, it has now evolved to become Occupy HK and The Umbrella Revolution. 10) It is led by these 3 personalities on the people's side: Reverend Chu Yiu-Ming, Mr Benny Tai (a professor at the University of Hong Kong), Dr. Chan Kin-man (professor at Chinese University of Hong Kong) and Mr CY Leung, Chief Executive, on the other. 11) Mostly, people are sitting, walking, picking up trash, doing their homework, handing out free water, food and face towels, drawing grafitti, cleaning up grafitti, chanting and clapping every so often and in short bursts. 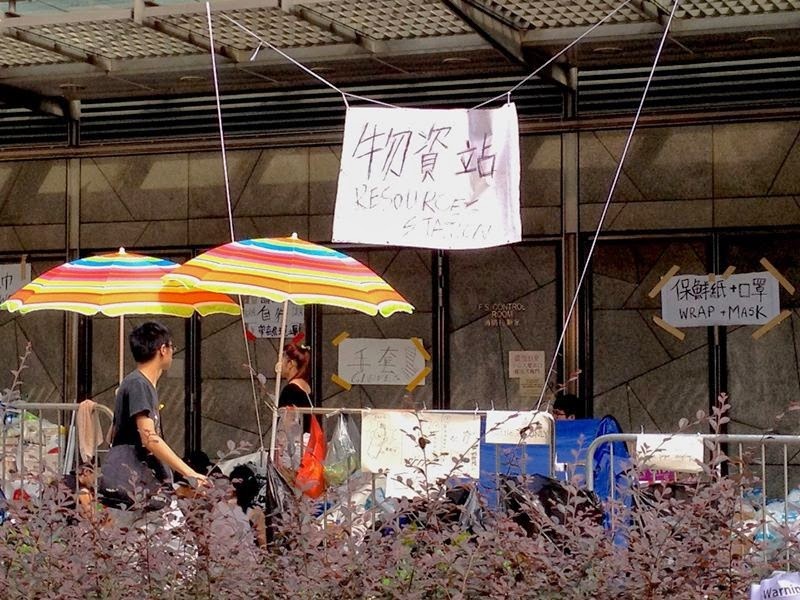 12) At night, there are more people that have come after school and work, and also because it is less hot. 13) During the day there are more young children and families walking through. At night it seems to be the millennials and Gen Y people that come out to represent and take over the night shift. I heard this is "to keep the protesting going" and the numbers consistently present. 14) Yes, there are Filipinos there. But not that many. 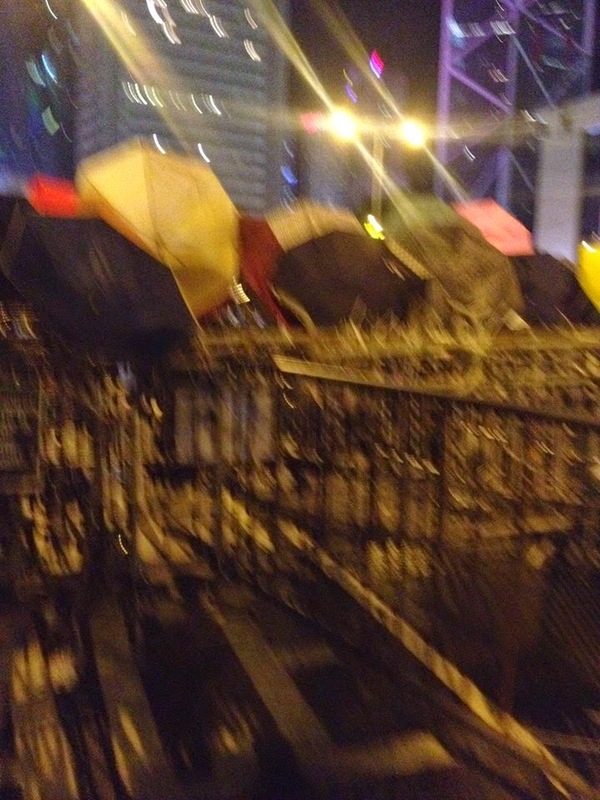 16) The yellow ribbon and umbrellas are the two symbols that have become synonymous with this movement. 17) At the end of the day, this is a fight for democracy and fairness. Whether or not a closer marriage between Hong Kong and China is the right thing to do is up to the HK people to decide. But they should at least have a say and a choice. That's all they want. 19) Do not be naive and think there aren't people out there being punished behind closed doors. I'm almost certain there are. And I can only pray justice will be served. 20) This is not over. At time of writing, this is Day 7 and we've yet to reach a resolution or next step. 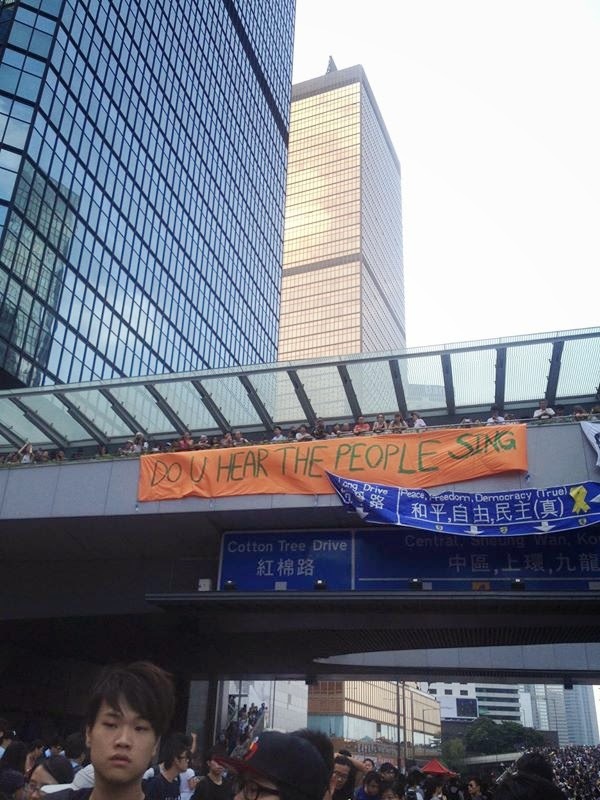 For now, what people want is for CY Leung to step down. The HK people feel he has let them down, failing to represent or speak on behalf of their interests, failing to control and take a lead on these protests. 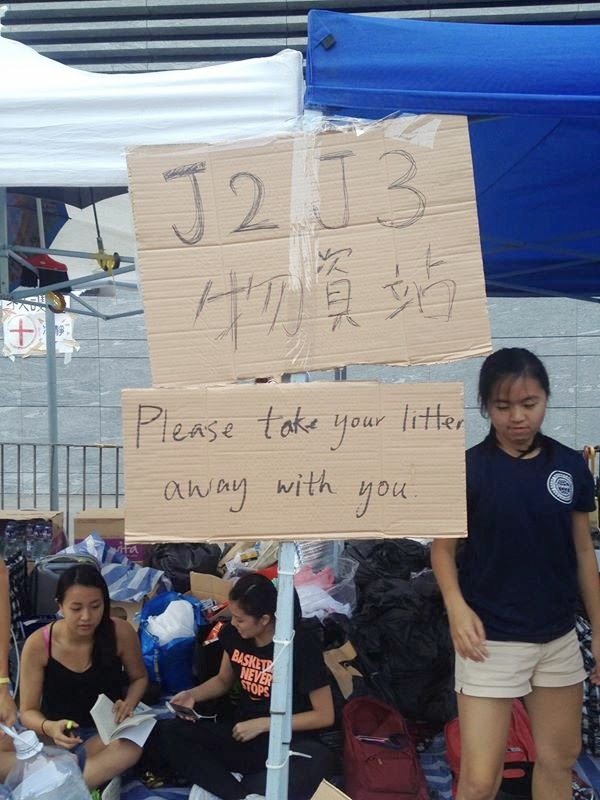 1) The HK people are an amazing, resilient and inspiring people. And I'm proud to have grown up, befriended and been influenced by them. And for once in my life, I've never felt closer to "home". 2) Regardless of your stance... I think this situation is worth paying attention to and watching, if only to witness the incredible solidarity, willpower and integrity of a nation that's come together. Not to cause a riot (people have actually been cleaning up after themselves because they "want to keep their city clean"!) but simply to be heard. 3) This is a small city with the power to teach not just China, but the world, a powerful lesson: peaceful protest is possible, and sometimes you have to fight for the things you believe in. 4) There are many few occasions in life where you get the chance to show people what you stand for, this is one of those times. And I'm glad to be a part. Krissa Curran is a HK Permanent Resident, Third Culture Kid/Global Citizen, Digital Marketing Consultant, Travel Entrepreneur and Yogi. She has called many places home but right now, she has never been more proud.